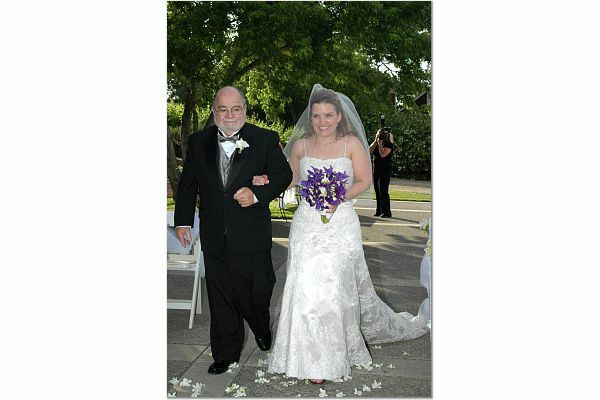 Friday, May 25 went much too fast, but I do remember having a fabulous time, being joyously happy, and getting a wonderful husband. 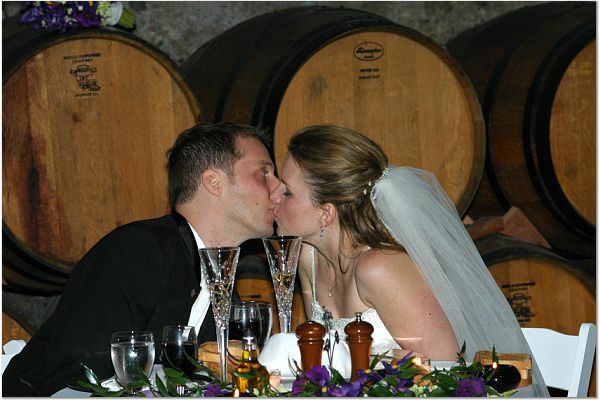 I have to steal pictures from other people, since I sort of couldn’t take pictures at my own wedding. Below is one from my dear friend Jenni at Four Feet More (or maybe her husband Jeff took this one). You can read a post she wrote about the wedding here. I managed to snag some photos from my in-laws’ (heh, I have in-laws!) various storage media, and save them to my laptop, and my avid photographer friend June (who I freaked with on the dance floor), took over 300 shots and sent me the link to her online photo album. Some of her shots are linked in this post, but so many of them are awesome, it was hard to choose which to steal. Matte and I will get many, many more photos from our photographers (who rocked, by the way). We’re getting all the original files on a DVD and I am sure there are a gajillion. Also? We had a photobooth at our wedding. Our friends and family got to leave with a print-out of their shots, but we get all the original digital files taken in the booth. I can’t wait to see what people did in that tiny little studio. 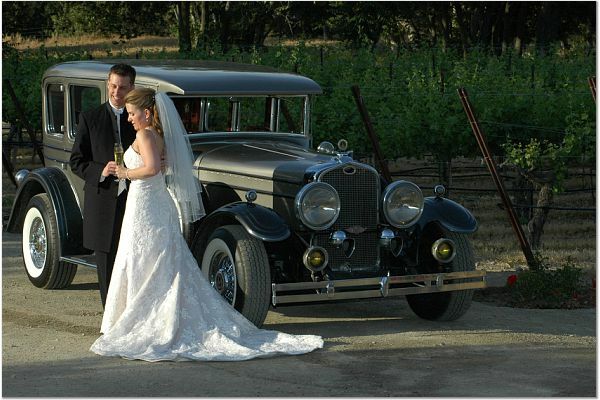 I made my entrance in a 1927 Stutz. My father helped me out of the car and then escorted me down the aisle to REM’s Endgame. 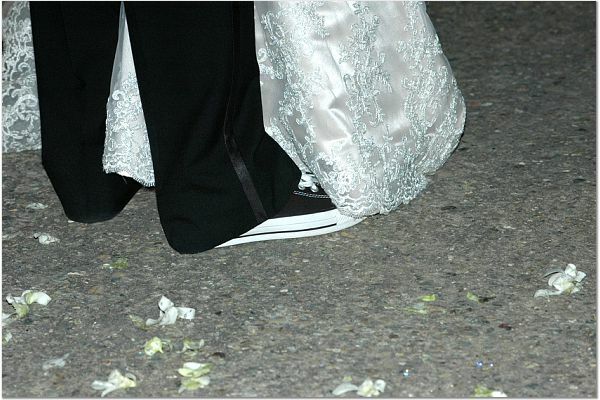 Matte, his groomsmen, and the ring bearers all wore black Converse Chuck Taylor All-Stars. I wore purple Steve Madden shoes, with a shilling on the inside of one, and Jasper’s nametag in the other. We had two officiants, Krissy and Alyssa, the two friends who introduced us two years ago. They were ordained by the Universal Life Church…online. After we were announced Husband and Wife, the DJ played Friday I’m in Love by the Cure, as our family and friends showered us with lavender. Because May 25 was also the 30th anniversary of Star Wars Episode IV, our tables at the reception were named after characters from the movie. In keeping with the Star Wars theme, we marked the road where guests entered the winery driveway, with a life-size cardboard cutout of R2-D2 and C-3P0 (guess which droid symbolized me?). Later, the cutout made its way to the dance floor, then into the photobooth, and eventually into Matte’s parents’ bed at their hotel. A couple of pranksters thought they were putting it in OUR bed, but we stayed at a different hotel (where we were welcomed with chilled champagne and rose petals, but no droids). In a show of more Star Wars geekery, the insides of the table cards listed trivia questions that guests had to answer if they wanted Matte and me to kiss. Just clinking their glass was not enough for us. They had to earn the smooching. We thought the questions were pretty hard, but apprently our friends are quite the Star Wars freaks because it seemed we were constantly mackin’. When it came time for the toasts, we were pelted with…toast. Matte and many of his friends are huge Rocky Horror Picture Show fans and did the Time Warp later on that night on the dance floor. I can’t believe how many people know the steps! I am definitely missing out. Our DJ got people dancing by playing some of my guilty pleasures like Britney Spears, Duran Duran, and Usher. He then did a triple-shot of big booty songs (in honor of yours truly) including Fat-Bottomed Girls. The song we chose for our last dance was Good-bye to You by Scandal and when it came on, I grabbed my mom and we did our best white-man overbite to end the night. It all could not have gone more perfectly. If I could do it all over again, I wouldn’t change a thing, except to be sure I got a whole piece of cake, rather than just two bites. Oh, and while I would love to take credit, Jeff took that shot. Oh, I love that picture. You look gorgeous! Congratulations on your wedding – it sounds like it went perfectly. I love the little things you did to make it your own. Congratulations, Catheroo! Your Wedding looks Amazing! I am glad it turned out So Well! Matte let you out of bed long enough to blog? 😉 Hope you are having a marvelous time on your honeymoon…and your wedding rocked the house down! Love ya guys! Sorry we couldn’t make it. As Allan said, sorry we couldn’t make it. But thank you for sharing a bit of your wedding with us here! Many congratulations! Sounds like you had a day to remember!